As a faculty team engaging with administrators, special education teachers, and general education teachers in the Los Angeles area in a professional learning context dedicated to transforming schools for inclusion, we have come to believe that we must dedicate our time to support K12 administrators to grow and expand their capacities to be better able to create shared vision, values, beliefs, and greater collaborative capacities among the adults in K12 schools and school systems for the purpose of building more inclusive schools. 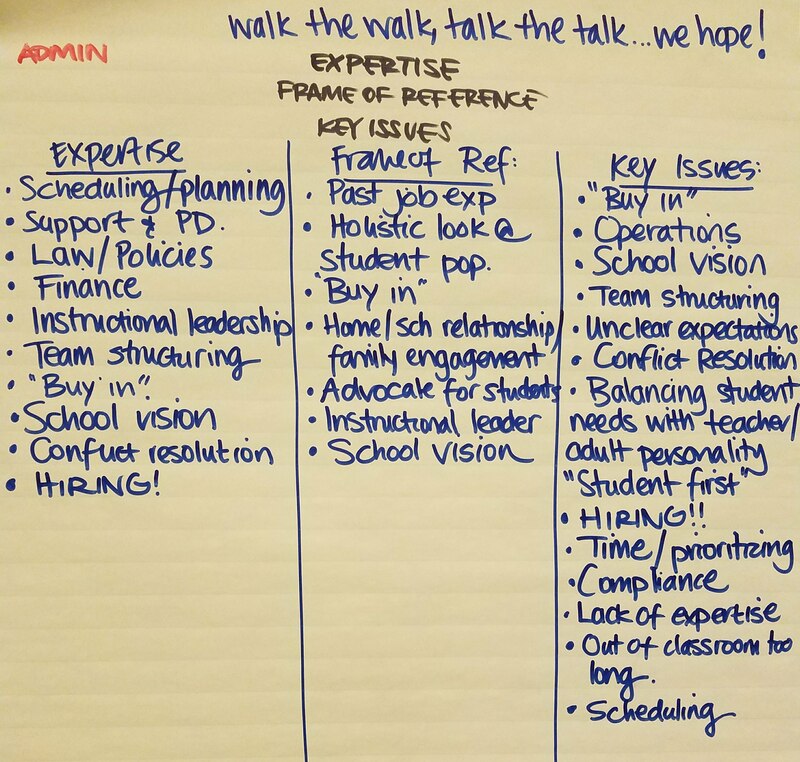 First and foremost, it is our belief that education leaders have the obligation and power to clearly articulate which adults, children, and families currently and historically reside at the margins–and which groups hold the valued place at the center. Key features of K12 education accountability systems hold administrators to the task of identifying sub groups performing below standards, which incentivizes an organization wide focus on those at the margins. In our work, we see this with students receiving special education and English language services. We also see this for children who live in poverty, especially in urban contexts where poverty and race have historically been coupled by the systematic effects of discriminatory housing and lending practices as well as state-run services such as schooling. Within this context, what we must demand of our K12 administrators is the capacity to understand the ways in which this context creates normative patterns in thought and action that discriminate against those receiving the label of “special” or deviant versus those considered “normal” in our schools. Beyond this understanding, we provide a call to action for K12 administrators to name these biases at play in our schools and classrooms, so that together adults serving children and families in K12 American schools can work collaboratively toward including all children and families, finding ways to put all children and families “at the center” of our education practices. Second, we challenge K12 administrators to break the normative divides in our schools pertaining to children who are “typical” learners versus those who receive specialized education services. These divides segregate children who carry the special education label from their peers place in general education and gifted programs. This segregation in most cases has a discriminatory effect on both children and the adults who provide special education services. 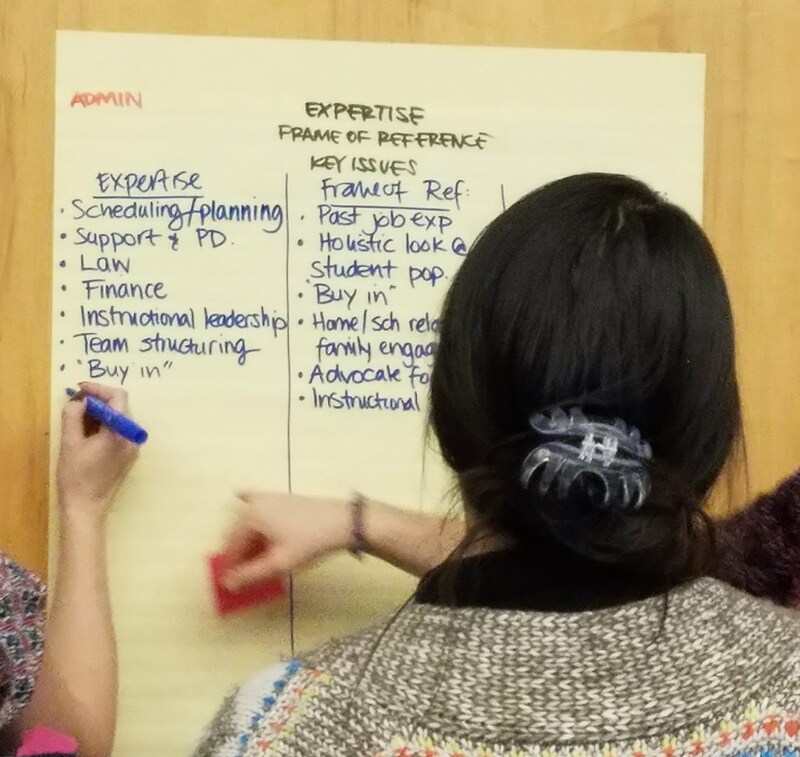 In our research and work with educators and administrators in K12 schools, we have seen that such a call to action requires professional learning that expands the capacities of administrators while also providing relevant skills and knowledge. We posit that to do this well, professional learning should include design elements grouped in two categories – a) structural supports for inclusive professional learning; and b) professional learning session content, activities, and outcomes. (9) Provide equal time to capacity building and skill-knowledge building learning experiences. 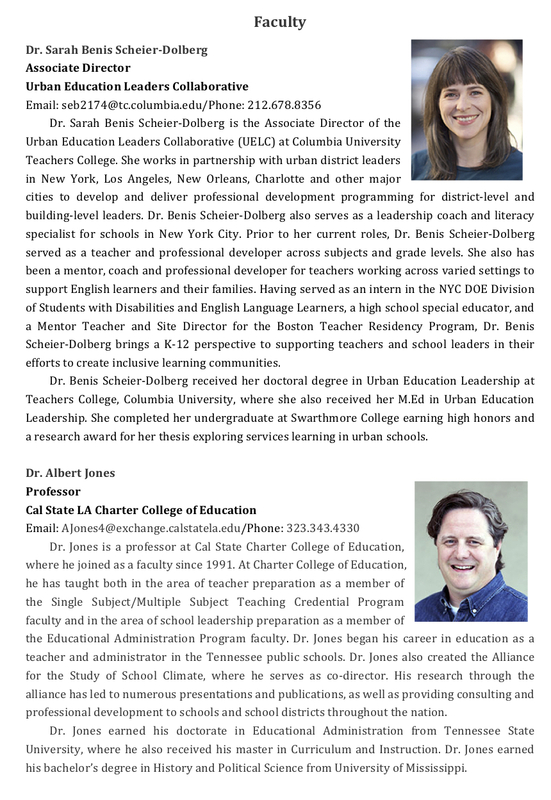 Sarah Benis Scheier-Dolberg is the Associate Director of the Urban Education Leaders Collaborative at Teachers College and is currently working in collaboration with Dr. Albert Jones, Dr. Leila Ricci, and Dr. KiMi Wilson on related research and publication projects on this topic. 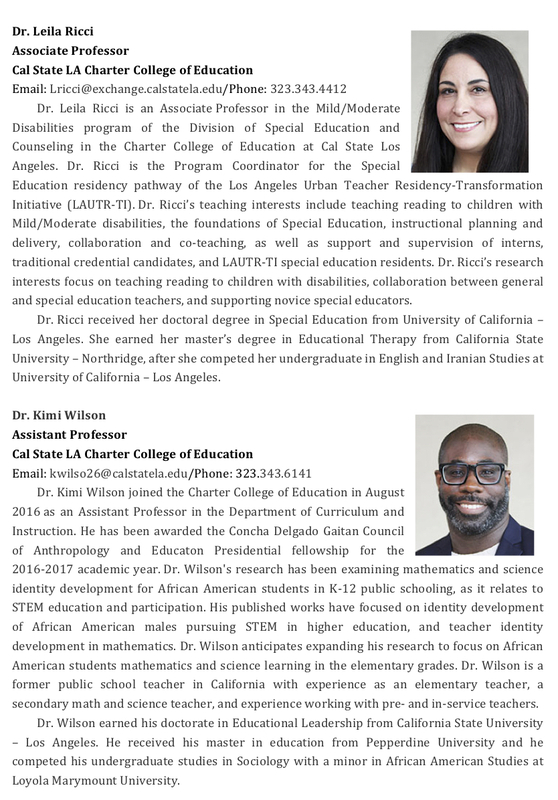 They serve as the primary faculty on the professional learning collaboration between Teachers College, Columbia University Urban Education Leaders Collaborative and the Cal State LA Charter College of Eduction. The teams bios and contact information are included below.